Well you probably know enough about me via my recent posts.It’s been almost four years of moving from Dubai to Mumbai and I do hope you have been following my food escapades.The hubs and me are quite the incorrigible foodies on the hunt for the best eating experiences from street food to fine dining and anything else that fits in between. 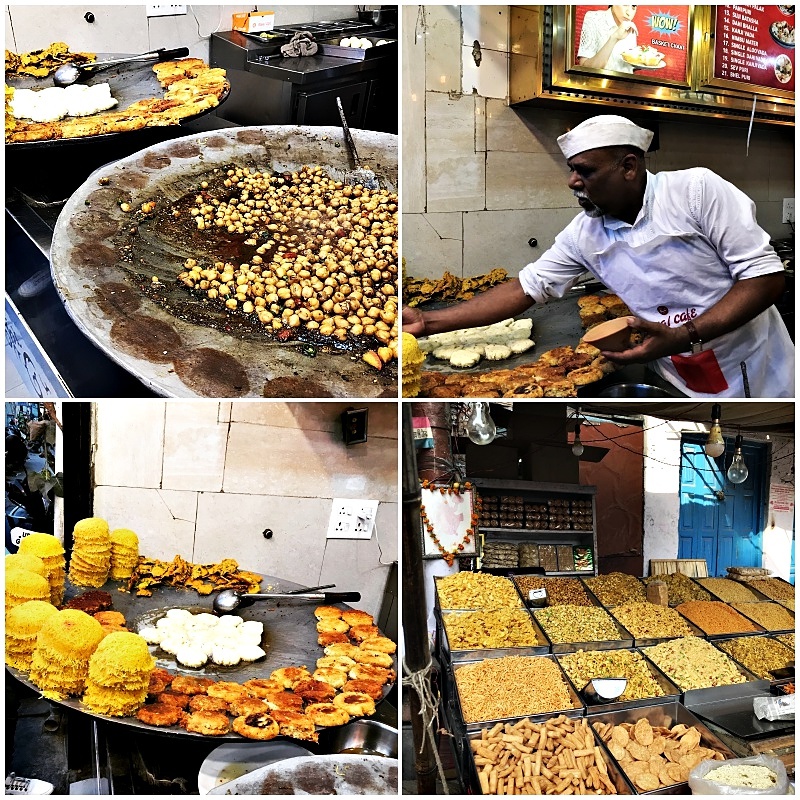 Our travels within India have been a delightful experience indeed.Having lived out of the country for over two decades now, exploring cities, their cultural influences and food nuances. Yes and I may have said this before “We will travel to any length of this planet, in search of good food”. A recent sojourn took us to the Northern India, Lucknow quite aptly named the “City Of Nawabs” and well know for it’s traditional cuisine, the delectable and melt in your mouth Kebabs in particular like the Galawati, Shammi & Kakori. The Lucknowi style of cooking is also quintessentially known as the “Awadhi Cuisine”, the rulers being the Nawabs of Awadh whose origin lies in Persia.And hence the cuisine has the influence of various meats, grains, spices, nuts and saffron. So yes ,in a sense this trip to Lucknow was a quick getaway over a long weekend along with catching up with wonderful friends who promised us a gastronomic experience and well for me it was in search for the best Kebab of sorts.The best part of discovering cuisine in a new city is having a friend that subs as a foodie expert and takes you through the finer aspects of traditional cuisine. Our friends Nandini & Ravi met with us in Lucknow and very sweetly had put together a list of “must eats”and “must do” in Lucknow. Well 48 hours is all that we could wring out of our crazy lives but such as enjoyable indeed. Our itinerary is left to our dear friends and we are totally excited as Ravi had planned a good packed few days for us. We both arrived into the city around noon and checked into the Hilton in Lucknow which was a very comfortable stay and in close proximity to all our jaunts. As per the plan we head out straight for lunch. 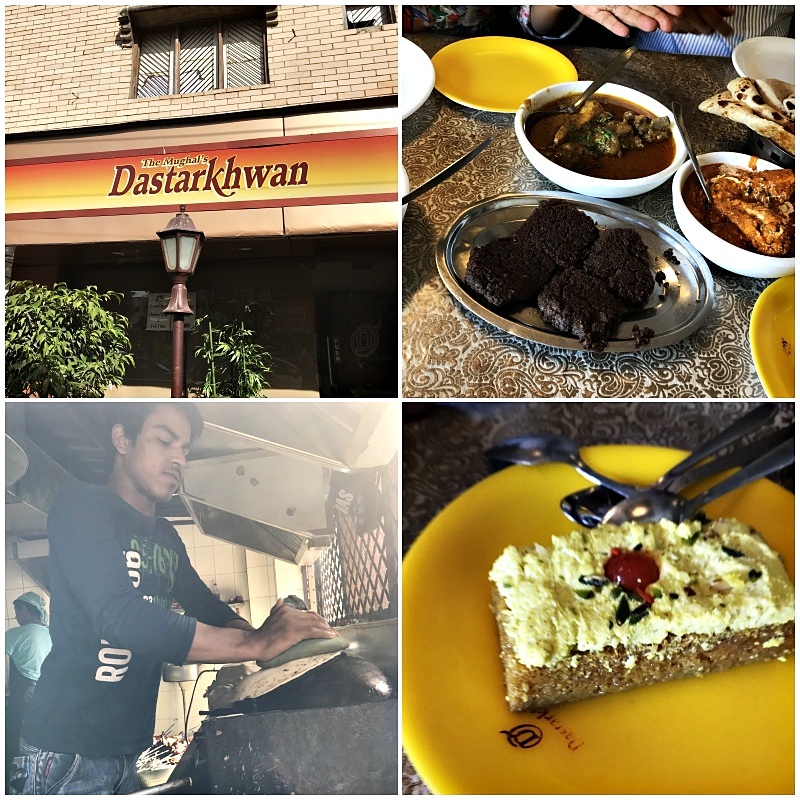 First stop is at a mid range restaurant called Dastarkhwan which is immensely known for it’s Mughlai-Awadhi style of cuisine. 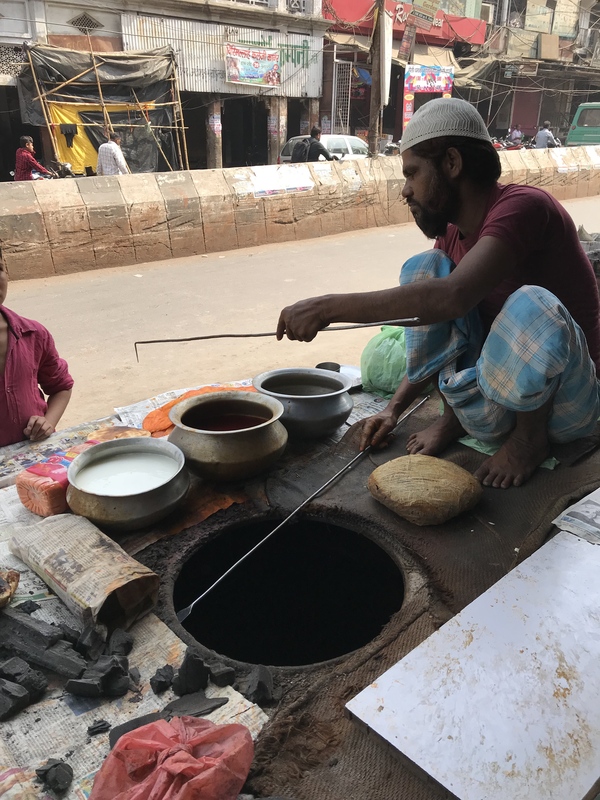 The chefs in Lucknow are the creators of the “Dum style of cooking”, which is the style of cooking on a slow fire. We are quite ravenous and are so looking forward to our lunch. We arrive around 3pm to find this place packed with late -lunchers and can’t wait to order. We left the selection of dishes to our friends and they surely delighted our palettes. 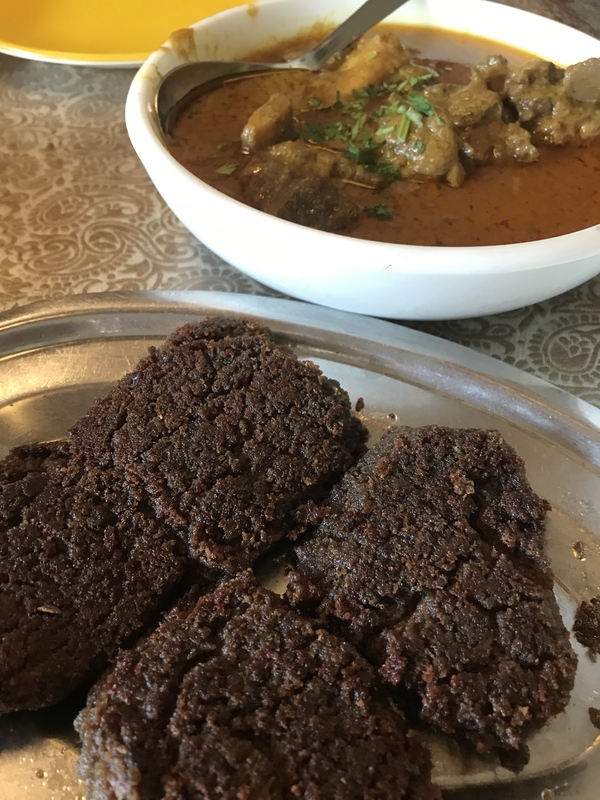 This place is famous for its Mutton Korma,Paya Curry and Galawati kebabs and also the Paneer Pasanda with rotis of-course. We ate at the restaurant in Gomti nagar, however they do have several other locations as well. 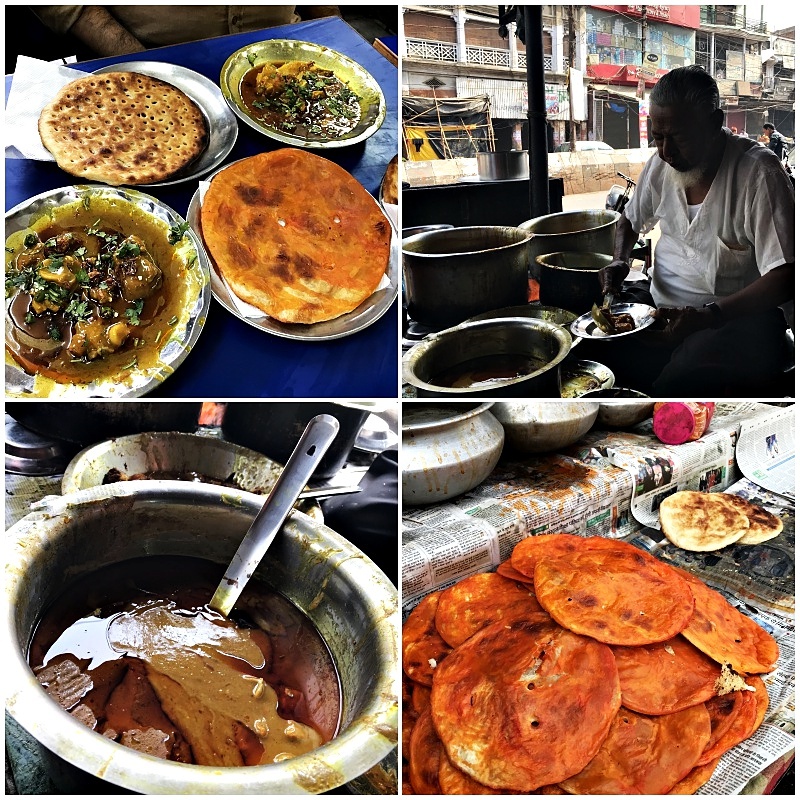 2.Sakhawat’s: I’m not a Glutton…Just an explorer of food. And the exploration and search was for the best kebabs. 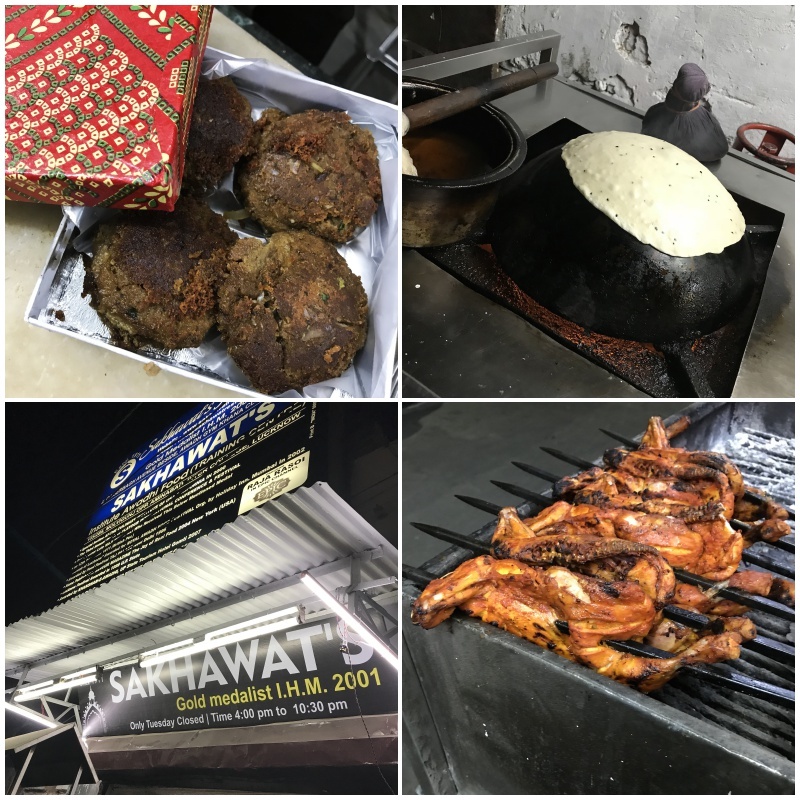 My friends knew about the obsession for the best ever Galawati and Shammi kebabs is what got me all the way to Lucknow in the first place. Now they have lived in Lucknow and know the hidden gems around the city and were keen that me make Sakhawat’s our next jaunt and explore this hole in the wall kind of place that serves up some finger licking good Kebabs,with the right blend of their secret spices and smoky charred flavours.We also sample some of their tandoori Chicken and hot rotis. 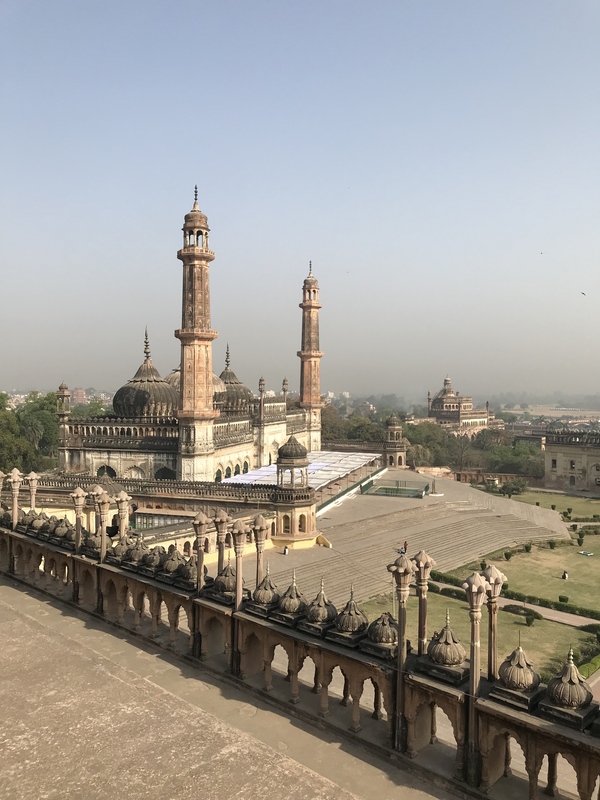 The next morning we start off from our hotel early in the morning to soak in the historical sights of Bada Imam Barah.Our friends have then planned out a breakfast that cannot be missed in Lucknow. It’s around 10 am in the morning now and our pit stop for the day starts at Rahim’s in Chowk. The breakfast dish which is a must try here is the Ghosht Nihari (which is a mutton dish) served with some hot Shermal. The secret of this iconic dish is the melange of the right amount of ground spices and the gentle and slow cooking of the meat. Nihari originates from the Urdu word Nahar which translates to day break and which is possibly why this dish is most often served at breakfast. 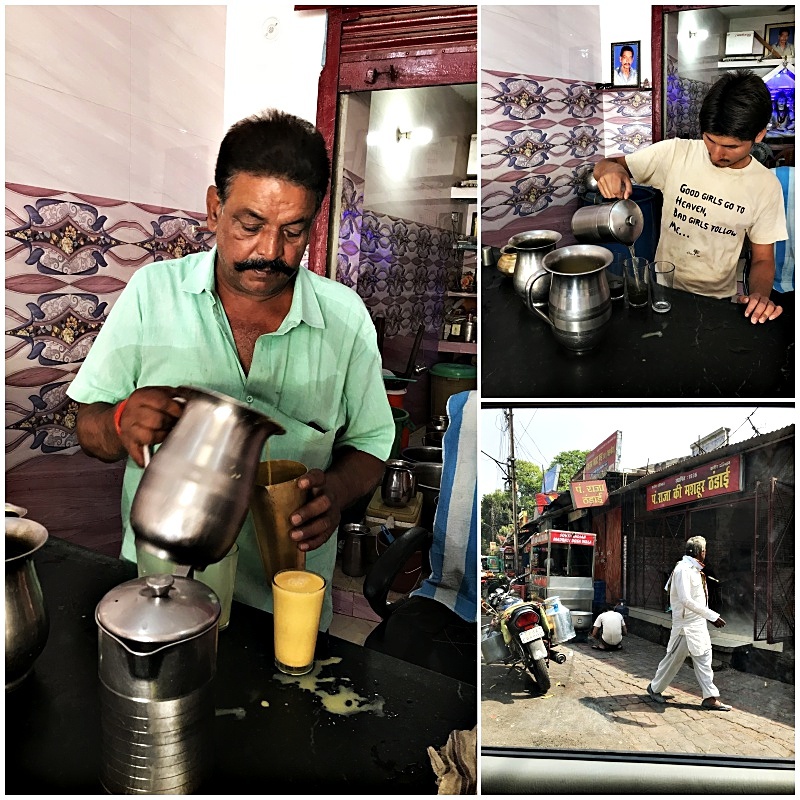 Having satiated every carnivorous desire for the moment its time to cool off the spicy breakfast we decided to stop for a glass of chilled Thandai. This popular chilled Milk based drink is utterly refreshing. 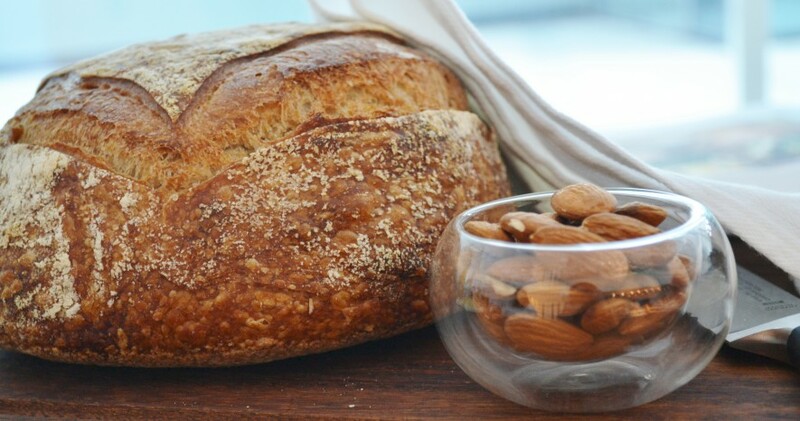 It is often mixed with powdered almonds, fennel, cardamom, sugar, saffron strands and crushed petals. Another variety of Thandai also has some cannabis added to it which it gives it an extra punch. This drink is very popular during festivals in India such as Holi and Mahashivrathri. Now with the bellies full it’s time to burn off those calories and turn to some retail therapy. My mind is set on exploring the old parts of Lucknow especially the Chowk and Hazratganj neighbourhoods and indulge in some “Chikankari work” This is traditional embroidery work that Lucknow is famous for. Apparently this was started off by “Nur Jehan”, the wife of the Mogul emperor Jehangir. The numerous stores have an array of different varieties of “Chickanwok”. Unstitched fabric, blouses, dresses, traditional wear and even saris embroidered with delicately on fabrics such as cotton, silk and chiffon. So much to choose from. 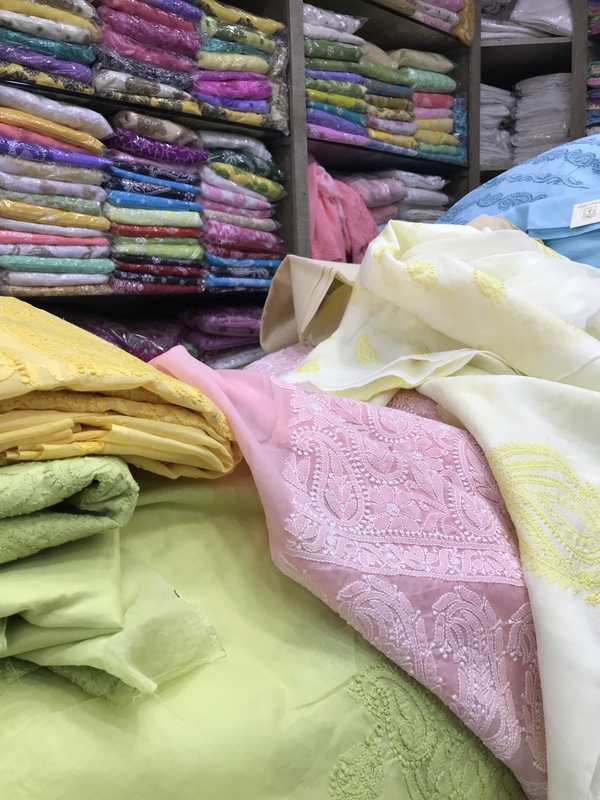 We browse through a multitude of stores as the variety is just mind boggoling.I finally settle for a couple of cool cotton blouses and some traditional wear that always comes handy for occasions in India. Quite exhausted by an early start and all the walking for the day we decide to have a light bite and then return back to our hotel for the day. Street fare is delightful and reasonable here in Lucknow and a great way to absorb the local flavours of a city.Now even though the list of these delicacies and the restaurants are endless, we decide to pop by the Royal Cafe and indulge in some Katori Chaat and pain puri and wash it down with a lemonade.That’s it for today I remark to my friends. It’s been an eventful day and a foodelicious one that too.Tomorrow will be another day I know and will bring in more food adventures I’m sure as its our last day in Lucknow like I said I was on the hunt for the best kebab. It’s our last day in Lucknow and we have a relaxed morning at the hotel.I’m in awe of the city, it’s culture and traditions. We seem to have absorbed a whole lot in our three day trip. Yet, I had started off in search of a delectable and delicious kebab flavour in mind. A flavour that i had very often relished at the Al Afadil kebab place in Sharjah during our stay in the middle east. I had not eaten anything that came even close to the shammi and galouti kebabs I had eaten there. so with that as a point of reference I still was in search.. We arrive at the iconic 100 year old Tundaay Kebabi place in Aminabad lucknow late afternoon. 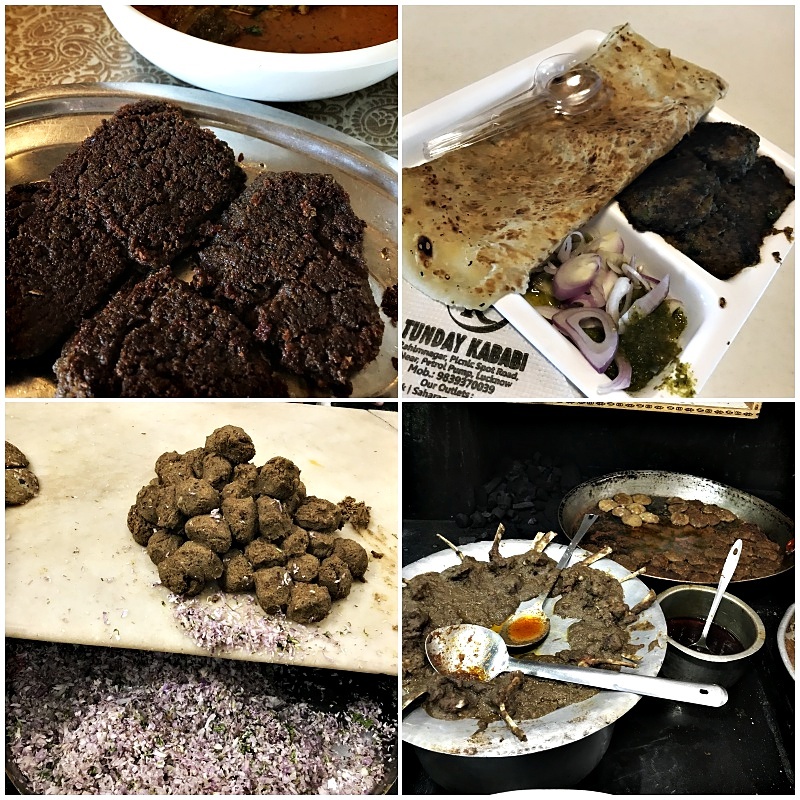 The place is simple and unpretentious and filled with the mid afternoon diners feasting on plates full of deliciousness, varieties of kebabs, curries, scrumptious plates of biryani’s, the aromas wafting through the air. I can feel my excitement build as I know I have come to the right place. ad sure enough the kebabs are absolutely delicate and they melt in the mouth. the galouti is essentially finely minced goat meat with and addition of almost 160 spices. The story behind these juicy and succulent morsels of ground meat is that. There was once a Nawab who apparently was very fond of kebabs.As he aged he lost his teeth and was unable to chew and hence waged a contest for his chefs to create the softest kebabs so that he may enjoy them.This secret recipe of the kebabs was was created by Haji Murad Ali, who in trying to perfect the best kebab fell off the roof and broke his hand. However this did not disuade him from creating his recipe and he perfected it.When presented to the nawab it was served as Tundaay ke kebab i.e. Kebab made by a single armed person.As a one armed person in India is called Tundaay, that is how the name Tundaay Kebab came about. 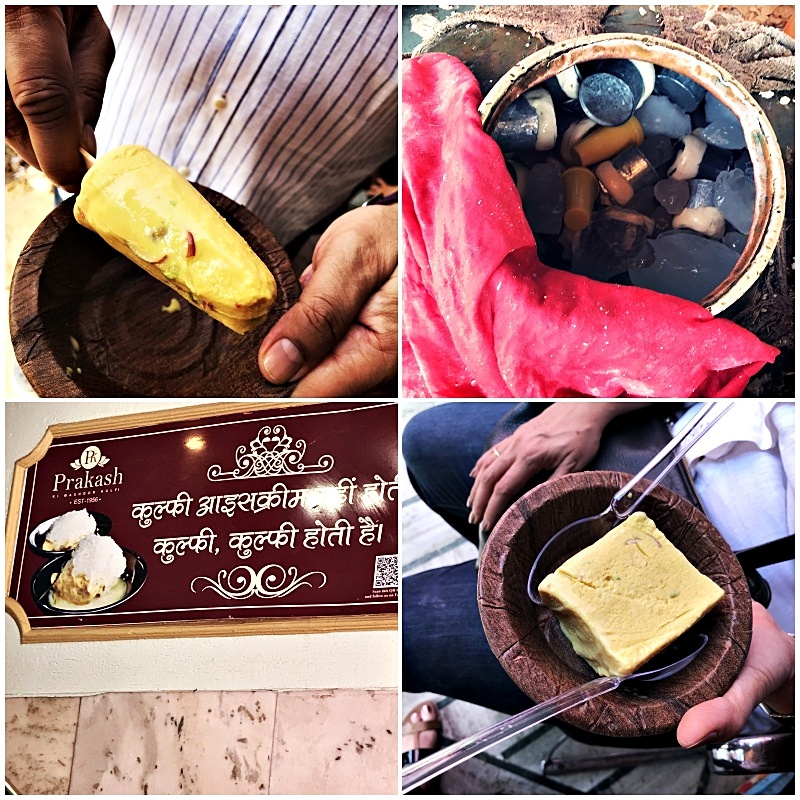 Apparently yet another must do when in Lucknow I’m told by my friends.again an institution in itself severing up delicious pots and cones of Indian ice-cream called Kulfi made with condensed milk, nuts such as pistachios, almonds and cashews, flavoured with sugar and saffron. Every bite is so refreshing and just delicious. A family run business for the past 50 years, this place is abuzz with ice-cream lovers, beating the heat and digging into various flavours of Malai, Strawberry, Butterscotch and Chocolate. We also visited the The Taj Vivanta for a fabulous meal (lots of kebabs of-course). We dined at the Oudhyana which is a fine dining restaurant and an elegant one too serving up some delectable and delightful Awadhi cuisine. All in all this trip was a great discovery of the land of Kebabs and Nawabs (royalty). I highly recommend every food enthusiast to take a peek into this foodie haven and trust me you won’t be disappointed. That said, I do hope my Lucknow diaries has lured you into visiting a truly delightful city filled with Culture, history & delectable Cuisine. Huge thanks to our wonderful foodie pals Ravi & Nandini Dayal for making this such a memorable holiday. Happy Travels & Foodelicious Wishes!